When it comes to finding the right compact or midsize crossover, there are plenty of models on the road. 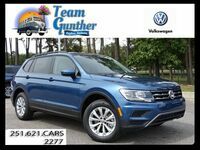 However, one model that offers plenty of attractive features with a unique style is the 2019 Volkswagen Tiguan near Mobile AL. This model flirts with the line between compact and midsize vehicles. It seats five passengers in its two-row configuration or seven passengers with three rows of seating. With the rear seats folded down the five-passenger model offers up to 73.5 cubic feet of cargo space, which means that the 2019 Tiguan can offer versatile passenger and cargo transportation options for busy families and individuals. All models of the 2019 Volkswagen Tiguan come with a 2.0-liter four-cylinder engine rated for 184 horsepower and 221 pound-feet of torque. Advantages like 4MOTION® All-Wheel Drive and selectable driving modes are also available to offer even more driving confidence. Drivers looking for comfortable and confident driving can find their match with the 2019 Volkswagen Tiguan near Mobile AL, but this crossover also offers advanced technology and interior features. The 2019 Tiguan is available in S, SE, SEL, R-Line and SEL Premium, all of which are available with all-wheel drive. Features like the VW Car-Net App-Connect system (which enables both Apple CarPlay and Android Auto) are standard on all trims, while advanced driver assistance features like Forward Collision Warning, Autonomous Emergency Braking, and Pedestrian Monitoring are available with the Driver Assistance package. On upper trims there are even more elite options available for discerning 2019 Tiguan drivers. Some highlights include V-Tex leatherette upholstery, Vienna leather upholstery, the configurable Volkswagen Digital Cockpit, a premium audio system from Fender, an eight-inch touchscreen infotainment system with built-in navigation, adaptive cruise control, a panoramic sunroof, LED headlights, an Easy Open and Easy Close Liftgate, blind spot monitoring and parking assistance. Would you like to learn more about the 2019 Volkswagen Tiguan near Mobile AL? 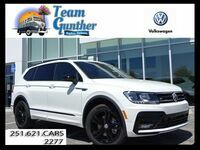 Contact Team Gunther Volkswagen in Daphne AL to learn more or even schedule a test drive to experience the value of the Tiguan for yourself.